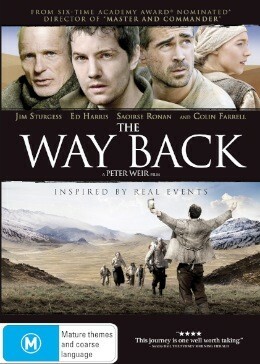 he Way Back is the first film from Australian director Peter Weir in over seven years, following on from 2003s highly-regarded Russell Crowe vehicle Master and Commander, and stands alongside Gallipoli and Picnic at Hanging Rock as a film which expertly and heart-breakingly documents the beauty and harshness of (human) nature. Janusz (Jim Sturgess, Across the Universe, Fifty Dead Men Walking) is a Polish POW sentenced to 20 years in a Siberian gulag after being denounced to Soviet authorities by his wife, who has herself presumably been tortured. There he meets American prisoner ‘Mr Smith’ (Ed Harris), a former actor named Khabarov and a hardened Russian criminal (Colin Farrell), and together, after an assortment of injustices and hardships would break the wills of lesser men, the unlikely allies decide to plan their escape. The film is loosely based on the book The Long Walk, which purported to tell of an inmate’s alleged escape on foot from a Siberian gulag and his subsequent voyage to India. The book itself was later exposed as a fake, and Weir himself has confirmed the film is essentially a work of fiction. Nonetheless it is a remarkably effective and tremendously authentic work, which encapsulates life in a WWII-era internment camp in all its depravity and horror. The incessant, all-pervasive ugliness of Stalin’s regime is also captured in all its profound repulsiveness, as is the desperate longing for freedom which so obsessed those sentenced to toil for decades in his grim, soul-destroying labour camps. Ed Harris puts in yet another solid, nuanced performance, as does Sturgess, who has proven time and time again he has, despite his relative youth, more than enough presence to carry a film single-handedly. Farrell likewise puts in one of his more memorable performances, although his perpetual tough-guy squint grows irksome after about the fifteenth minute. Overall The Way Back is a first-rate escape movie, and an impressive addition to the canon of one of Australia’s most inimitable directorial greats. The sole bonus feature is a 30-minute Making Of, which contains interviews with Weir and all principal castmates, behind the scenes footage, insights into the creative and collaborative process, and so on. It’s comprehensive and insightful, and an excellent complement to the feature itself.